Reaching the 50 year mark in a marriage is quite a milestone. Too many marriages don't make it to 25 years, let alone 50. A monumental feat like this should never be passed by. Recognizing your spouse or the happy couple on a 50th wedding anniversary lets them know how much they are loved. A married couple endures may trials and tribulations throughout their relationship, so celebrate the big day, and be sure to tell them how much you respect the longevity of the marriage. Celebrating large milestones like the 50th anniversary is one way couples can rekindle the romance from days long past. This is one anniversary worth celebrating! You wandered into our website for a reason. You must be interested in gifts you could purchase for someone celebrating a Golden Wedding Anniversary. We must admit, we are happy you are here and we are confident to say that you came to the perfect place to buy that special gift. A Gold-Dipped Eternity Rose is a gift to warm any heart. Men adore our roses just as much as our female customers do. In fact, our customers love to tell us just how much they admire our products and how touched their loves ones were when the gifts were given. Most people agree that typical gifts for the 50th anniversary can be boring. How many gold pens, gold number 50s, gold plates or gold picture frames does one couple really need? The gesture is sweet, but these gifts will end up in a drawer or cupboard, never to be looked at again. Customers who give or receive one of our Eternity Roses can’t wait to tell us how much they love the beauty of each rose, and how thrilled they are to know this rose will last forever. These unique roses are a gift that keeps on giving. 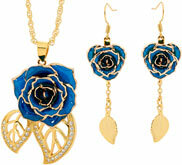 It is well known that a rose is the symbol of love. Giving one red rose signifies eternal love and devotion. No one seems to know when this connection began; however, it would be a good guess to say that men gave their lady loves a single red rose as far back as we can remember. We have taken this wonderful symbol of love and transformed its beauty into a fine work of art. Each rose comes in an elegant leather display box that most couples leave open and on display. Since each rose is a work of art, it only makes sense to exhibit it. 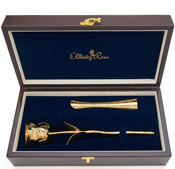 Why not mark this special occasion with a Gold-Dipped, or Gold-Trimmed Eternity Rose? 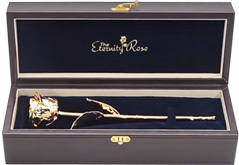 A gorgeous Gold-Dipped Eternity Rose, with wonderful words of love engraved on the long stem, is the perfect gift to give anyone celebrating their 50th anniversary. Who would not love such a gift? Some people say that celebrating anniversaries goes back to the days of the Holy Roman Empire. Some believe that the celebrations started in medieval Germany. Both are correct. During the Roman Empire, men would bestow upon their wives a silver wreath on their 25th anniversary, and a gold wreath to mark their 50th wedding anniversary. In medieval Germany, it was friends, family and neighbors who came bearing silver or gold gifts. Although not too many people receive silver or gold wreaths in today's celebrations, the tradition of silver for the 25th anniversary, and gold for the 50th has remained constant throughout time. At one point, the diamond was the symbol for the 75th anniversary. This changed when Queen Victoria held a celebration on the 60th anniversary of her assuming the throne. The celebration was the queen's Diamond Jubilee, and the name stuck as the symbol of the 60th wedding anniversary. Before 1922, most anniversaries did not have a themed gift like the 25th or 50th. In 1922, Emily Post, a well-loved American author, came up with a themed gift list for every anniversary year. Then, in 1937, the American National Retail Jeweler Association decided to add to Ms. Post's list, so that there are suggested gifts for each year up to the 25th, and every 5 years thereafter. This list is very popular and commonly referred to today, and you can read our section on Anniversary Gifts by Year to see this information in more detail. Reaching 50 years in any relationship is a pretty phenomenal feat. Celebrating a 50th wedding anniversary should be a major production - almost as big as the wedding itself! Of course, some couples may not want a big celebration, while others are completely ready to party big. If you are planning your own anniversary celebration, or planning for your parents or friends, keep in mind the couple who will be celebrating this milestone. Some couples might enjoy a romantic get-a-way for two, whilst something as simple as a romantic dinner by candle light, followed by a slow dance can be more than enough for others. 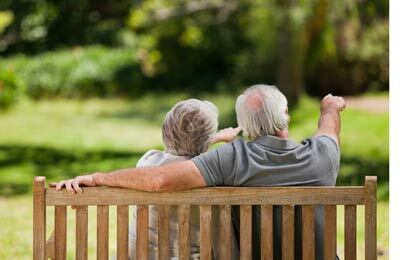 After 50 years of marriage, most couples already own everything they need and desire, so choosing a gift for a golden anniversary can become a time-consuming event. You want to buy a gift that the happy couple will love and want to put on display. You certainly don't want your gift to be hidden away in some dark closet. You could jump in the car and drive from store to store looking for the perfect gift, or you could shop online. Either way, you are going to spend endless time looking for a gift that is unique. Gold is a beautiful metal. It is strong, and resists corrosion. Maybe this is why gold is linked to the 50th wedding anniversary: after 50 years of marriage, one can assume the marriage itself is strong and has resisted a lot of corrosion over the years. It takes a strong couple to remain together for half a century! Gold also stands for wealth and optimism, two things a long-married couple have usually acquired. 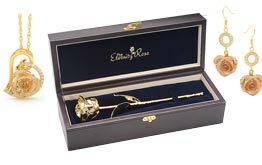 A Gold-Dipped or Gold-Trimmed Eternity Rose would be the perfect gift on this special anniversary. Yellow roses and violets are also flowers most associated with the 50th wedding anniversary, and so a Glazed Yellow Eternity Rose that is gold-trimmed would also suit the occasion. Golden or Imperial Topaz are additional suggested symbol ideas for the 50th anniversary. You don't have to be a professional poet to write something heart warming. Poems do not have to rhyme, so write free form. Still stumped? Search online for a poem that touches you (and will touch them) and either print it out on gold decorated paper or handwrite it using gold ink. Finish by placing the poem in a pretty gold frame. If the celebrating couple love to listen to music together, talk to their family and friends for song ideas and burn a cd with their exclusive songs. Chances are, many people will know of a song or two that the couple enjoyed over the years. If no one has a clue about particular songs, ask about favorite music styles they might both enjoy. Music has a way of bringing us right back to those moments when we first heard the song. Recapture those moments for the happy couple. This is a gift they will enjoy often. Some may decide to use fabric paint, some may embroider a design. A nice idea for the grandchildren would be to take their picture and have it imprinted on the quilt block, adding the child's name and birthday with fabric paint. Little hand prints - with identifying names - are another good idea for your family quilt. Make sure you give your family members a 'return by' date for the blocks. This will give the sewer time to assemble the quilt before the big day. This is a big gift that the anniversary couple will treasure, and proudly display in their home. Get in touch with your family and everyone who knows the celebrating couple, and ask them to find, and share with you, pictures of the couple throughout their 50 years of married life. Use these photos to create a scrapbook of memories from then and until now. You can scan and print out each picture, or ask everyone if you can use the actual picture. Either way, you will end up with a one-of-a-kind gift that will be the topic of conversation for a long time. Creating a wish tree is another idea that involves family and friends. Since most people who have been married for 50 years are not in need of anything, why not fulfill some of their wishes? A wish tree can be filled with things they would love to do in their twilight years, or things to help them relax more at home. The sky is the limit on this gift idea. Start by finding a sturdy branch that will look nice on display. It needs to have a lot of smaller branches on it to hold little trinkets. Next, paint the whole branch with gold spray paint. Let it dry, then place it in a large bucket that is filled with enough rocks and soil to keep the branch upright like a tree. Have party guests bring gold lace, ribbons and trinkets to the festivities. Have them (or designate one person for this task) hang things from the branches. Guests can purchase event tickets, vouchers for a meal at the couple's favorite restaurant, travelers checks, movie tickets and tickets to other venues the couple might enjoy, and tie each of these to the wish tree. The wish tree is a gift that keeps on giving, long after the parties are over. If these ideas did not spark your creativity, click here for more inspiration. Handcrafted gifts are treasures that you give from your heart. Creating a guest list should be fairly easy. The celebrating couple have been together 50 years; they must have plenty of friends and family who would love to attend their 50th wedding anniversary party. However, think about your venue before you invite everyone on your list. Also, think about what the couple would want. Would they enjoy a large gathering with hundreds of friends and family, or would an intimate dinner with a few select friends be more appropriate? What could be easier than decorating for a 50th wedding anniversary? Not much! With a theme of gold, it should be easy to find balloons, drapes, ribbons, table coverings and other decorations in golden hues. Don't forget to get a large '50' to hang in a place of prominence. Gather a large collection of photos of the couple throughout their years together. Purchase inexpensive gold frames and arrange these pictures all around the venue. Hang them on walls, or arrange them on tables and shelves. Let guests walk through the couples' long life together. Choose music that the couple loved when they got married. Do add songs from the past as well as current times. If the couple has a special song they love to dance to, be sure to have that included in the musical selection. Give your guests the 'gold carpet treatment.' Instead of rolling out a red carpet, make yours gold to fit the theme of the day. Give guests sweet chocolates wrapped in gold foil as they step on the carpet, then welcome them inside with gold and white flowers, and champagne in a gold trimmed glass. Don't forget to thank each guest for coming to your party. You put effort into it, and you should let them know you are thankful they put effort into attending. If finances allow it, it is always nice to give each guest a small parting gift as a token of your appreciation. 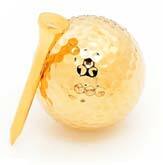 Candies in gold boxes, gold key chains, and other small golden trinkets all work well as thoughtful gifts. A bottle of wine or champagne, tied with gold ribbons and bows is always welcomed. If you used Eternity Roses on your tables, you could give these golden beauties to your guests. Who would not want to take a gorgeous Eternity Rose home, to keep and display forever? Beyond parties and gifts, there is always the option of giving the happy couple a gift of adventure. Why not send them on vacation to a place they have always longed to visit, but have not yet made it to in their 50 years together? Major trips can cost a lot of money. Talk to other family members and friends and see if some of them will help you with expenses. The more that pitch in to help, the more luxurious this trip can be. The world is just waiting to be explored - give them the gift of adventure! * Kirk Douglas and Anne Buydens celebrated their 50th wedding anniversary in 2004. * Bill and Camille Cosby have been married over 50 years. They have five grown children. * Paul Newman and Joanne Woodward were married for 50 years. Paul, who was married for 10 years before he met and married Joanne, was a faithful husband until he died in 2008 from lung cancer. * Queen Elizabeth and Prince Phillip have been married almost 70 years! "Chains do not hold a marriage together. It is threads, hundreds of tiny threads, which sew people together through the years." This quote, by Simone Signoret sums up the lives of two people who have remained together for 50 years or more. 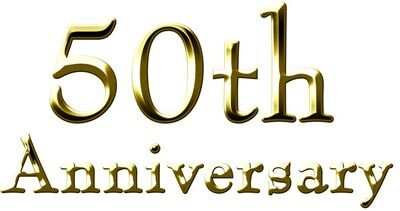 Those lucky enough to reach the milestone of 50 years together deserve more than a token 'congratulations!' They deserve to be showered with love and respect for the example they are showing to those who know and love them. Congratulations on your accomplishments. Happy Golden Wedding Anniversary from everyone at The Eternity Rose.